Introduction: Flipping jigs, finesse jigs, swimming jigs, casting jigs... when did jig fishing become such a specialized technique? Used to be you just had to choose between which type of head you wanted to use based on whether the bottom was rocky or full of weeds, but now you have to add consideration for how you're going to fish that cover into the formula. Well, of those categories we listed, there is one that decodes into the words every recreational fisherman likes to hear and read. They are the two words that relieve the paralysis brought upon by too many choices. If you're looking for one type of jig to do it all, jigs with the designation of "casting" can be considered your "all purpose" jig. Today we take a look at one such jig with this designation and it is made by Spotsticker Baits. 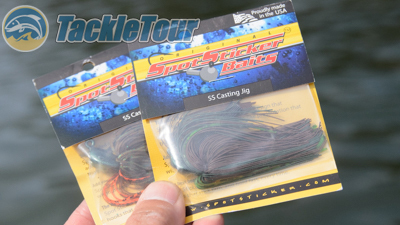 Introducing Spotsticker Baits's Casting Jig. Impressions: What makes a specific jig a casting jig versus a flipping jig versus a swimming jig, etc? Really it's all in the hook. Nothing is stopping you from using any type of jig with any type of head for any specific purpose, but the type of hook that is used to build that jig is there with consideration of what type of tackle you will be using all in an effort to help make that task of setting the hook easier. 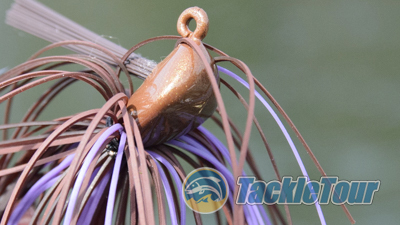 Essentially, the lighter the tackle you will be using, the thinner wire hook you can use in the jig. 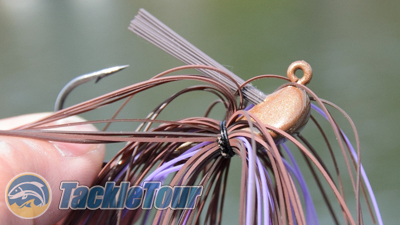 The thinner wire hook you use in a jig means easier hook penetration, but if you use a thin wire hook with heavy tackle, you run the risk of having that hook straighten out. In jig-speak, Casting Jig is a pseudonym for all purpose. With that being said, flipping hooks use heavy gauge wired hooks because the assumption is you're using very powerful rods with heavy pound test line so you can exert a lot of pressure on the fish to pull them out of cover. A thin wire hook will not cut it in these situations. Conversely with a swimming jig, where the assumption is, you're using lighter line and tackle so as not to spook the fish with line diameter, a thinner wire hook will allow you the hook penetration you may otherwise not be able to achieve with a heavy gauged hook on light tackle. Spotsticker uses a nice quality paint with tiny metal flakes on their jigheads . For the seasoned jig fisherman, it can get even deeper than that talking about head type, line tie angles, etc., but the type of hook that's on your jig is the predominant deciding factor. Casting jigs simply walk the line between these two specialties.